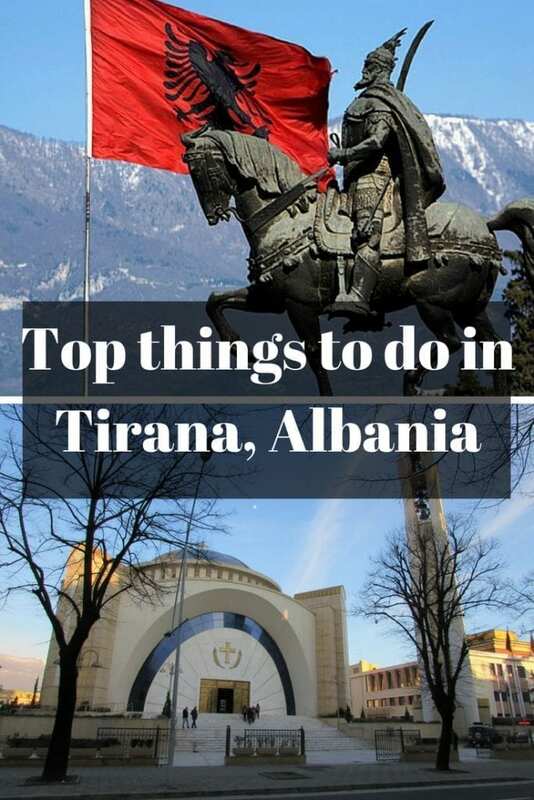 A travel guide to all the best places to visit in Tirana, Albania. With most of the best Tirana tourist attractions located in the Albanian capital city centre, it's easy to put together a Tirana sightseeing itinerary. Here's 10 of the best things to see in Tirana. If you are planning a trip to Albania, then you need to visit Tirana, the country's capital. Whilst small in comparison to other European capital cities, it's interesting nonetheless. Tirana is a developing city, and perhaps an example of how Albania is progressing after throwing off the years of almost complete isolation. It's also got its fair share of historic monuments, such as Hem Bey mosque and the clock tower, communist architecture and the central Skanderberg Square. 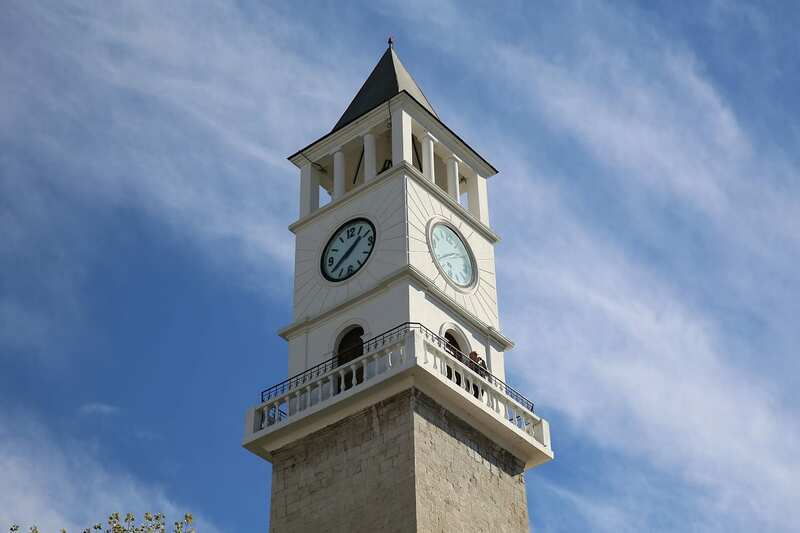 How much time in Tirana, Albania? You can visit all of the tourist attractions in 2 days in Tirana if you wish. You could probably squeeze that into a day if you are super-keen, but I'd recommend spending longer in the city if you can. It is the heart of this proud, developing nation, and presents an orderly and modern face to a country some people have wrongly pigeonholed as dangerous and chaotic. Take your time, and you can experience one of the best things to see in Tirana. The progressive optimism that bubbles away underneath its surface. Tirana is a fairly small and compact city, and most of the Tirana tourist attractions can be visited in one day. A good way to get your bearings, is by taking a free walking tour in Tirana. Our guide Gazi was a great help, not only for pointing out the buildings, but as a general source of information. The walking tour starts at 10.00 am each day outside the National History Museum. It focuses on the immediate area around Skanderbeg Square, and lasts two hours. Remember to leave a tip at the end! After taking the tour, and exploring Tirana on foot myself over several days, I have listed below what I consider to be the essential things to see in Tirana. As mentioned, you could visit all these places to see in Tirana in 24 hours if you wished, but a day or two longer would be more rewarding. 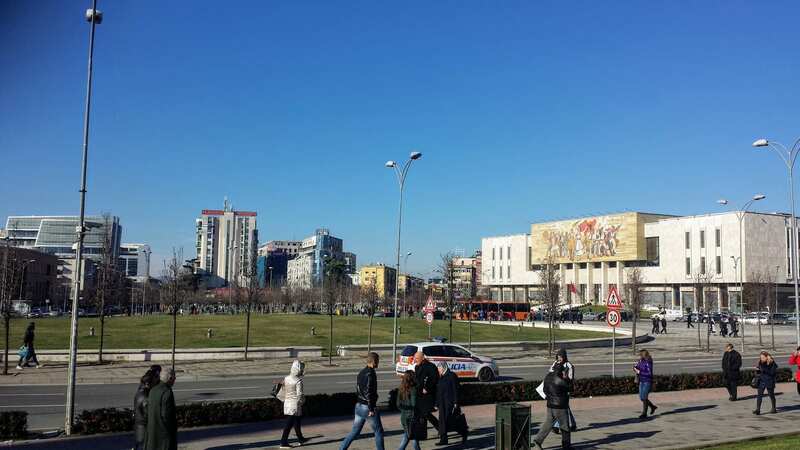 This enormous square is the central point of Tirana, from where roads to other parts of the city and country radiate out. There are a number of points of interest around the square itself, and in the centre, is a large statue of Skanderbeg. Skanderbeg is the national Albanian hero. His claims to fame include carving people in half with a gigantic sword, and resisting the Ottoman Empire. (Read a fun history of Skanderbeg here). You will probably pass through Skanderberg square a number of times whilst sightseeing. If possible, it makes sense to choose a Tirana hotel close to the centre when looking for accommodation. 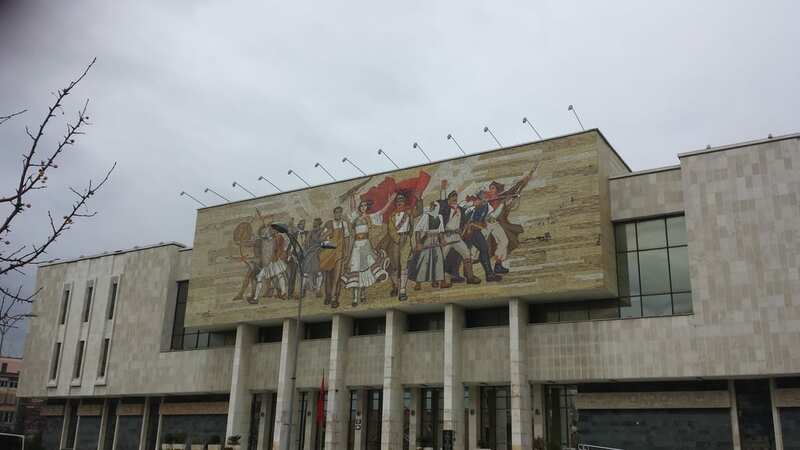 This is the largest museum in Albania, and is easily recognisable due to its communist inspired mosaic on the front facing Skanderbeg square. If you only have time to visit one of the Tirana tourist attractions, it should be this. It was our favourite museum on this mini-Balkans tour, although a few more signs and exhibits written in English would have been nice. Allow at least two hours. 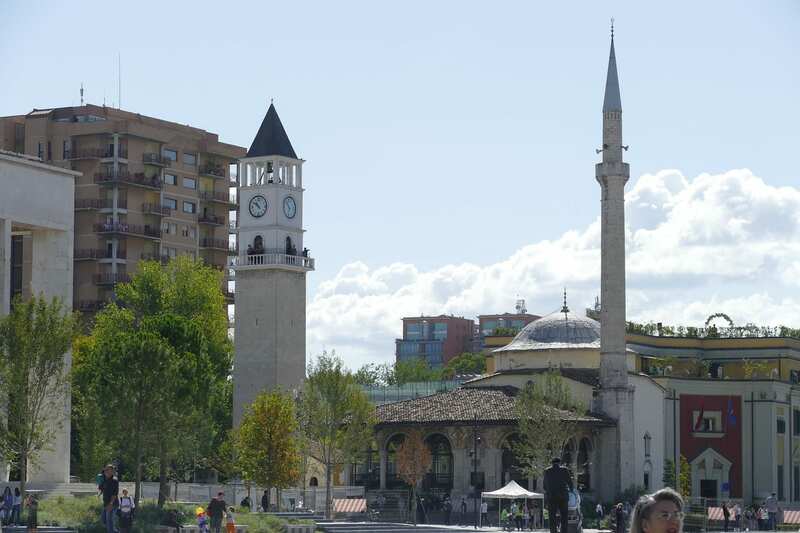 Located just off Skanderbeg Square, the clock tower in Tirana is next door to the Et'hem Bey Mosque. In the past, you could climb up to the top of the clock tower, however it has been closed to tourists for some months. If it opens up, please let me know so I can update this list of things to see in Tirana! This 18th century mosque is situated right next to the clock tower. It plays an important part in the modern history of Albania. Closed during Communist rule (as religion was banned), it reopened illegally in 1991 when 10,000 people went to worship. The authorities did not intervene, and it was a key moment in the ending of authoritarian communist rule. 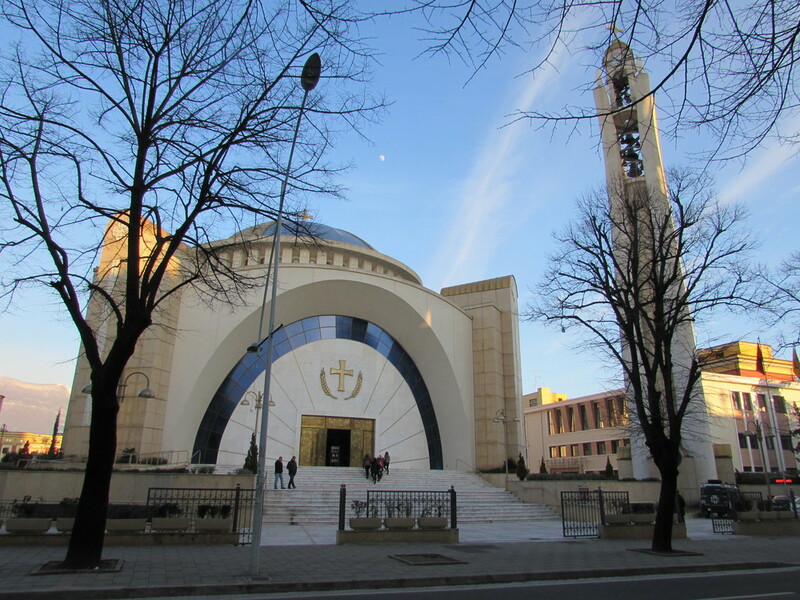 Albania now enjoys religious freedom, with people of all faiths living happily side by side. At the time of writing, the Et Hem Bey mosque was closed for restoration. When it reopens, let me know so I can update my guide on things to do in Tirana! 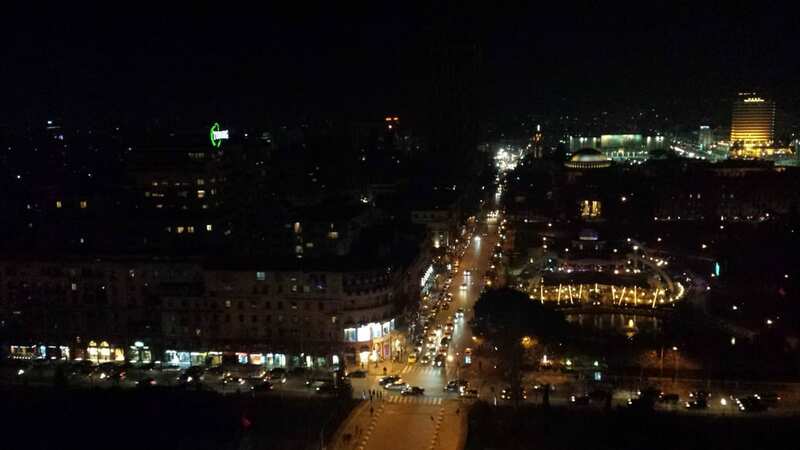 Did you know that Tirana has its own revolving bar with excellent views out over the city? The Sky Tower should definitely be visited, and seeing the city lit up at night whilst enjoying a drink is a pleasant way to spend an hour or so. Address: Rruga Deshmoret e 4 Shkurtit, 5/1 Sky Tower, Tirana Albania. Check out the reviews of the Sky Tower on this Tirana Tripadvisor review page. This is one of the strangest looking Orthodox churches I have seen! Opened in 2012, I can only imagine how much money must have been spent on this church. Wouldn't it be wonderful if the same donors could build a hospital of equally grand stature? This is an upmarket and trendy area of Tirana, which most tourists will head to at some time. There are numerous cafes and restaurants opening up around here, and you can also see the house of Enver Hoxha, the former Albanian dictator. 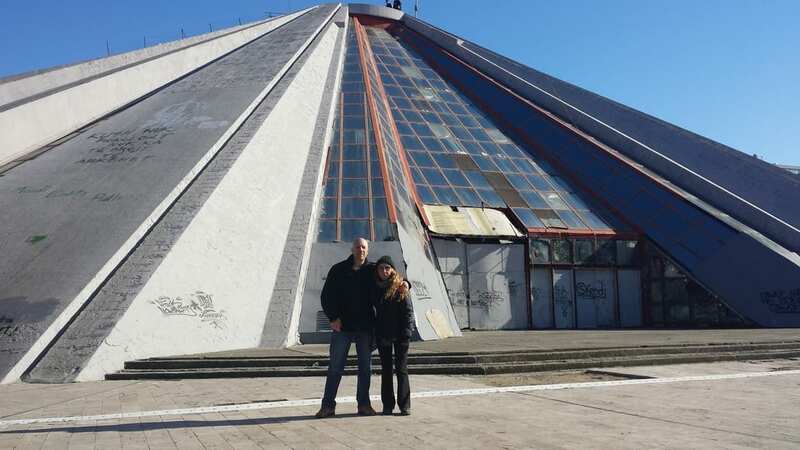 This would probably be the most visited of the Tirana tourist attractions if the general public were allowed inside. Perhaps one day the Albanian tourist board may open this building as a museum? Update June 2018 – This may have now happened! I have heard of tours to the former home of the Albanian dictator by the same people that organise the free walking tours. I am still puzzled as to what to make of this pyramid! Is it a blot on the landscape, or a landmark which should be protected? No one seems to know quite what to do with it, although I personally think it would make a great casino. You can walk the steep slopes to the top of the pyramid, just be careful on the way back down again! This collection of communist inspired propaganda art has to be seen to be believed! Some of the paintings and works of art look almost cartoon-ish, and portray images of valiant citizens working hard. This is another museum where photos are not allowed (which is a massive shame). A visit here gives a valuable insight into how a state propaganda machine works. It enlisted artists and intellectuals to portray an ‘authorised' image of the country. I imagine that the only country close to this today would be North Korea. Enjoy the great outdoors, and take the Dajti Express Cable Car up to the top of Mount Dajti. Once at the top, you have the choice of soaking up all the scenic views your eyes can take, or hiking along some of the paths in the national park area. Regrettably, we didn't get a chance to do this on this trip. Hopefully next time! There are, of course, other things to see in Tirana which I have not listed here. Think I have left something important off this list of Tirana Tourist Attractions? Have something else to add about Tirana? Please leave a comment below! Your Tirana experience doesn't end when the sun goes down! There's plenty of bars in Tirana, restaurants and other activities to keep you occupied. I've already mentioned the Sky Tower as a place you can eat in Tirana, but here are a few other recommended places. Looking for somewhere to chill out for a drink at the end of the day, or perhaps carry in a party? These are some of the best bars in Tirana to choose from. 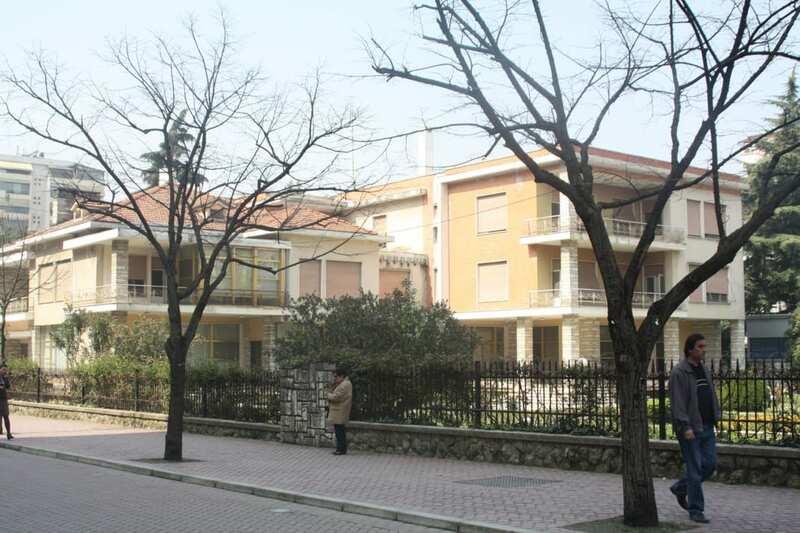 If you are looking where to stay in Tirana, these suggestions are a good starting point. You'll find accommodation to suit every budget, from backpackers hostel Tirana through to luxury hotels in Tirana. If you want to base yourself in Tirana for a few days, these day trips to other parts of Albania might be of interest. Thanks for sharing. I’ll visit Albania and Tirana in a few months and those tips seem very useful.